I remember one of my first moments of going “wow, this is so cool” in relation to roleplaying supplements. It was after seeing and thumbing through The Call of Cthulhu Companion for the first time. After that, I was sold on the Companion format. Rolemaster used Companions to great effect, and my own first steps as a game writer I dubbed The Unofficial Cyberpunk Companion. I did one for WFRP as well. So basically, I love Companions, and their eclectic mix of stuff that can be both enormously useful and mind-numbingly useless. But it’s the mix that’s the thing for me, the chance to read many different views on the game in question fills me with anticipation. So it comes as no surprise that I really like The WFRP Companion. I’ll be up front about that, and about the fact that I’m a sucker for the concept. The physical book is a softbound tome, it clocks in at 128 pages and it’s black and white. This is in my mind a very good format for a Companion product, to underscore its premise of “here are some stuff that might be cool for your game, but also some stuff you might not like”. In the pages of the book we find an abundance background, new careers, new rules and new NPCs. Credits (1 page) – Of note is the bunch of writers involved. The Companion is a result of an open call for submissions that Black Industries put out, and those who frequented the BI forums recognise many of the names from there. Introduction (1 page) – a background to the contents in the same style as the introductions in the other books. A Guide to the Known World, by Owen Barnes (7 pages) – covering what’s outside the Empire. Freaks, Thieves and Travelling Folk, by Andrew Peregrine (8 pages) – a detailed look at the life of carnival folk. Life and Death on the Reik, by Andrew Law (9 pages) – harking back to the information given in Death on the Reik, this is an expose of life on the greatest river in the Empire. Contains four new careers, Stevedore, Foreman, Wrecker and Riverwarden. Advanced Trade and Commerce, by Jude Hornborg and Dan White (17 pages) – An extensive piece covering most aspects of trade in the Empire. A very nice mix of rules and background material. Star Signs and their Meanings, by Kevin Hamilton with Robert J. Schwalb (7 pages) – instructions on how to use star signs in your campaign. Medicine in the Empire, by Steve Darlington (8 pages) – is there a doctor in the house? If not, use this article to inflict medicine on the hapless adventurers. Social Conflict and Advanced Criminal Trials, by Jude Hornborg (10 pages) – put your social skills to use, you uncouth adventuring scum! Provides a basis for clashes of wit instead of steel. Sartosa, City of Pirates, by Eric Cagle (7 pages) – care for change of focus in your campaign? Send your characters to Sartosa. Enough information to get you going is presented here. Tobaro: City of Sirens, City of Fools, by Andrew Kenrick (8 pages) – An exposé of the city of Tobaro in Tilea. Contains one new career, Deepwatcher. The Cult of Illumination, by Brian Clements(5 pages) – a cult to drop into your own campaign. Pub Crawling, by Jody Macgregor (6 pages) – a bunch of Inns to visit. Bring Up the Guns! The Imperial Gunnery School of Nuln, by Bill Bodden (7 pages) – A look at the Gunnery School, with maps and a new career, Artillerist. Gugnir’s Blackpowder Shop, by Eric Cagle (4 pages) – meet Gugnir. He makes and sells gunpowder. Perilous Beasts, by Andrew Law and Jody Macgregor (17 pages) – a few classics and some new faces presented in the same format as The Old World Bestiary: Amoebae, Behemoth, Bloodsedges, Bog Octopi, Chameleoleeches, Doppelgangers, Mermaids, Naiads, Patchwork Men, Promethean, Reik Eels, Spites, Stirpikes, Tendrophilus Fungus, Tree Kin, Triton. Phew, quite a bunch of critters there. The best, most interesting and useful articles are Freaks, Thieves and Travelling Folk; Life and Death on the Reik; Advanced Trade and Commerce; and Social Conflict and Advanced Criminal Trials. The rest of the pieces are well written and contains many fun and interesting ideas, but their utility is not as great for my campaign as the others. Given the hit and miss of the usefulness of the articles, I think the price of the book is a bit steep. 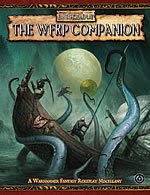 For some the mix has been a turn off, but for me the format makes The WFRP Companion an exciting book, and provides me with plenty of inspiration for my game. So with the above in mind, I highly recommend it, but also caution that you check it out as much as you can before purchasing it. Previous Article WFRP: Seals and Letters Galore!